NEW: Families urge N. Korea "to show compassion"
(CNN) -- The families of two U.S. journalists sentenced to 12 years of hard labor in North Korea pleaded for clemency, urging the communist government to "show compassion" and release them. 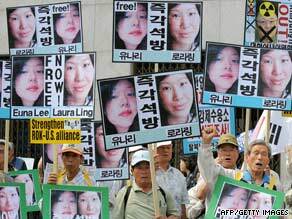 Demonstrators in South Korea last week call for the release of Laura Ling and Euna Lee. Laura Ling and Euna Lee were arrested in March and sentenced after a closed-door trial for what the state-run North Korean news agency KCNA called the "grave crime they committed against the Korean nation and their illegal border crossing." They are reporters for California-based Current TV, a media venture of former U.S. Vice President Al Gore. In a joint statement Monday, their families said they were "shocked and devastated" by the trial and sentence and urged Pyongyang "to show compassion and grant Laura and Euna clemency and allow them to return home to their families." "Laura and Euna are journalists who went to the China-North Korea border to do a job," they said. "We don't know what really happened on March 17, but if they wandered across the border without permission, we apologize on their behalf and we are certain that they have also apologized." In Washington, U.S. Secretary of State Hillary Clinton told reporters the United States is seeking the immediate release of the two journalists on humanitarian grounds. "Obviously, we are deeply concerned about the length of the sentences and the fact that this trial was conducted totally in secret with no observers," she said. "And we are engaged in all possible ways, through every possible channel, to secure their release." The families said Ling suffers from an unspecified "serious medical condition," and Lee has a 4-year-old daughter "who is displaying signs of anguish over the absence of her mother." "We believe that the three months they have already spent under arrest with little communication with their families is long enough," they said. The United States has no diplomatic relations with North Korea, and Sweden represents U.S. interests there. The Swedish ambassador told the U.S. State Department that no observers were allowed in the courtroom for the trial, and the ambassador was allowed to see them only three times. Senior Obama administration officials told CNN that several weeks ago, Clinton wrote a letter to the North Korean leadership appealing for the journalists' release on humanitarian grounds. In the letter, officials said, Clinton told the North Koreans that the families were deeply concerned about the women and went into details on their personal situations -- that Ling has serious health problems and Lee is the mother of a young child. Several senior administration officials said the idea of sending either Gore or New Mexico Gov. Bill Richardson to Pyongyang on a mission to get the journalists released has been floated to the North Koreans. No answer has come so far, but the expectation has been that once the trial ended, the North would accept a visit by either Gore or Richardson to secure the journalists' release, the officials said. "The rhetoric of the North Koreans has not been terribly harsh against the two women," he added. Officials said if precedent is any indicator, and given the way the women have been treated -- staying in a hotel for the past few months -- it is possible the women will never see the inside of a prison. Richardson traveled to the North Korean capital, Pyongyang, several times to secure the release of an American detainee in 1996 and facilitate the return of the bodies of POWs from the Korean War. In the 1996 case, the United States paid the isolated communist state what were called "hotel bills" for his stay. Officials said the issue of a possible payment to North Korea has not yet been discussed, but they said the United States would not be averse to playing along.